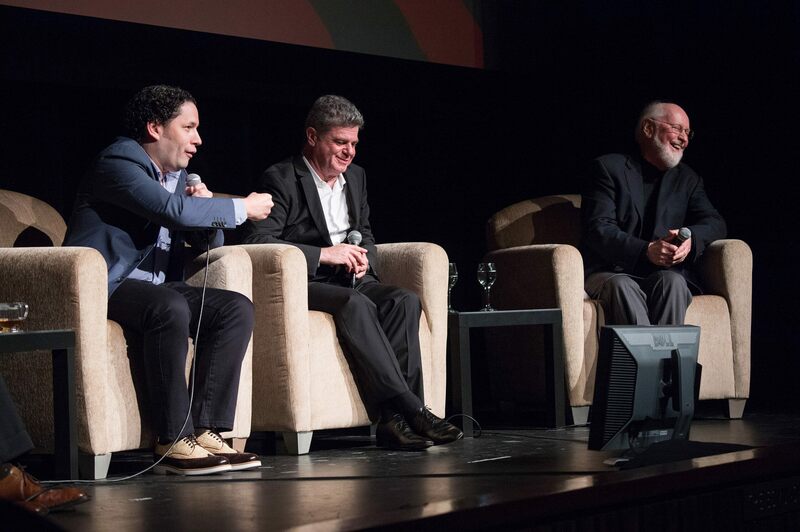 Gustavo Dudamel, Gustavo Santaolalla and John Williams – three of the biggest names in music today – joined the Academy for a special evening celebrating the art of the film score. The illustrious trio discussed significant musical moments in film that have inspired their work as they examine the art and process of creating a film score, as well as the director-composer collaboration. The constantly evolving art of the film score took center stage at the Academy event “Behind the Score: The Art of the Film Composer” before a sold-out crowd on Monday, June 21, 2014 at LACMA’s Bing Theater in Los Angeles. Three film music luminaries gathered to share their thoughts on craft as well as explain how their work was influenced and how it continues to evolve as a force that moves audiences around the world. Academy President Cheryl Boone Isaacs welcomed the audience and introduced the evening’s host, Tavis Smiley, who hosts his self-titled PBS late-night television talk show and Public Radio International’s The Tavis Smiley Show. In addition to authoring 16 books, he also is the founder of the nonprofit Tavis Smiley Foundation. The three guests for the evening reflected a dynamic range of talent in the current field of film music, starting with Gustavo Dudamel, music director of both the Los Angeles Philharmonic and the Simón Bolívar Symphony Orchestra of Venezuela. The charismatic conductor recently completed his first feature film score for The Liberator (Libertador). Next came Gustavo Santaolalla, winner of two Academy Awards for his original scores for Brokeback Mountain and Babel, who also has earned 16 Grammy Awards and released numerous albums. Santaolalla’s substantial film credits also include such titles as 21 Grams, The Motorcycle Diaries and Biutiful. Finally making his entrance was the legendary John Williams, who has scored over 100 features, including all six installments in the Star Wars series, Superman, the first three Harry Potter films, and numerous collaborations with Steven Spielberg, including E.T. The Extra-Terrestrial, Close Encounters of the Third Kind, Jaws, Jurassic Park and the Indiana Jones series. With five Oscars and 49 nominations to his credit, he also became the face of film music for a generation of fans as the music director of the Boston Pops Orchestra. The evening was divided according to three topics, with specially selected film clips introducing each topic. First came a demonstration of film music in its purest form, as it sets the mood without the distractions of dialogue at the start of a film; the chosen titles were Melancholia (2011), Paris, Texas (1984) and Chinatown (1974). The second topic was building suspense through music, illustrated by clips from The Mission (1986), Jaws (1975) and Vertigo (1958). Finally, the evocative power of music was illuminated in scenes from American Beauty (1999), Elevator to the Gallows (1958) and Braveheart (1995). Between clips, Smiley engaged in a number of insightful conversations with all three artists, touching on music’s ability to capture a universe of emotions in a single note, whether a composer prefers to see film footage fresh or read the script beforehand, whether a good score can salvage a troubled film, and if a composer knows right away when he’s crafted a particularly good piece. The answers, as seen in the videos above, proved to be alternately powerful, humorous and deeply poignant – a testament to an essential part of the moviegoing experience that can be equally appreciated as pure entertainment and a vital, richly rewarding art form.